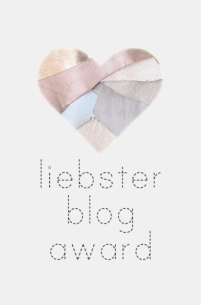 The Liebster Blog Award is supposed to be given to smaller, deserving blogs with 300 or less followers in hopes of sharing that blogger’s hard work with the rest of the world. You are supposed to thank the person who nominated you as well as nominate 3 to 5 blogs yourself. Finally, you can answer some questions about yourself that your nominator either came up for you or used in their own acceptance blog. I have borrowed some of my nominator’s questions. So, to get started, thank you, Pixie Bubbles, for nominating me! This is my first blog award, and I am so happy to receive it, especially from someone I had not known previously. Not only do I appreciate the award, but I am happy to have discovered your blog, http://lifewithchocolateandcoffee.wordpress.com, which I will be following from now on. What keeps you writing when you have writer’s block? I hardly ever have writer’s block, strictly speaking (writer’s procrastination is another story). When I do, I stop and think about my novel and what's wrong with it—what’s tripping me up, in other words. Usually, I’m trying to force a character. Sometimes I’m not really immersing myself in the scene, so the writing feels clichéd and flat. If I can identify what the problem is, then I’m energized to go on. If not, I go back and edit a previous section. That almost always gets me back in the flow. Most writers have a literary counterpart—a character from their stories who reflects themselves. Tell us about yours.Nina Pennington from The Not Exactly Scarlet Pimpernel, my first novel, is the most like me: a historian, better with books than with people, socially awkward, serious, a bit literal minded. I’m not shy now, but I used to be when I was younger. And Nina was more like me in earlier drafts, but I learned from writing Nasan (in The Golden Lynx—my second book, just published) that it’s easier to write someone who’s less like me. What are your passions? Writing, reading, taking classical ballet classes. Cats—I have two, and they’'re great. I also have an odd weakness for new software programs. You’ve had a fight with your significant other and you want to fix things. I do the opposite of what my characters do! I try to listen to my husband’s point of view—not immediately, while I’m still angry, but as soon as I can—and try to keep talking until I can imagine what the problem looks like to him. And apologize, even if I think he’s exaggerating. There’s almost always something to apologize for, and it helps get past the emotional barriers of both people trying to prove they're right. What’s one injustice you see in the world that you would fix in a story?Most of the injustice in the world comes from one group of people judging others on the basis of superficial characteristics. Even when my characters start out doing that (and most of them do, in one way or another), all my stories encourage people to see past those outward differences and recognize others’ humanity. Characters who make that leap succeed; those who don’t, fail. If you could change one thing in your life, what would it be?I would have started writing fiction earlier, so that I could have learned more and established professional ties sooner. And I would like to write full-time, or at least half-time, from now on. I can’t afford to do that yet, but I would love to one day. What’s important to you at this point in time?Finishing the series I’ve started and finding a way to have more free time to do the things I love, including spending time with my family. Do you make it a habit of telling others what you thought of their work, even if your experience wasn’t good?I never offer critiques unasked. If people do ask me, then I tell them the truth, but the truth includes the good as well as the bad. So I start by looking for what I liked in their work, then I offer positive, specific suggestions for how to fix the problems. For example, I would say, “I don’'t understand why this character reacts this way to this event” or “If someone treated me this way, I would want to kick him,” not “this character makes no sense” or “I hated this section.” Even if it’s true, it’s not helpful. The person won’t hear what the problem is or know how to fix it. And in most cases, it is not true. More often, a vague response expresses laziness or frustration on the part of the critiquer, who didn’t take the time to figure out exactly what s/he was reacting to. Last, here are my nominations. I will notify each winner personally. As Pixie Bubbles noted when she nominated me, I selected these people because they seemed to have put time and effort into creating interesting, thoughtful blogs that deserve to be better known. Some of them I know, others I don’t, but quality, not friendship, was the deciding factor. I also tried to pick sites that had not already received awards. So check them out. You should find something you like! And so that the winners do not need to ask (as I did), being nominated is the same as winning. So start investigating the blogs you yourself would like to nominate! P. S. Karen Adams writes to me that she can’t participate at this time, so I would like to nominate in her place Bryn Hammond’s blog: http://amgalant.com. I just discovered Bryn’s blog last night, after making my choices and writing this post. While I think it will interest many people, it has a special meaning for me. My Legends of the Five Directions series explores the lives and culture of Genghis (more properly, Chinggis, Jinggis, or Jenghis—that g is soft) Khan’s descendants, so it deals with similar topics at a different time. Does It Really Cost Nothing to Produce an e-Book?